“When you arrive in a village, everything may seem normal at first but then you start to notice things,” explains Assumpta Ndumi. “It is lunchtime but there is no food on the fire. There are children in the village but no laughter or play. These are some of the signs of chronic malnutrition.” For Assumpta, Save the Children’s nutrition adviser for East Africa, chronic malnutrition is a problem every bit as serious as acute malnutrition, even if it seldom captures the headlines. “In Kenya last year, the acute malnutrition that followed the drought was widely reported, but even before the rains failed there was a hidden hunger and children were dying because of it,” she explains. Assumpta has witnessed firsthand the situation faced by children in Ethiopia, South Sudan, Darfur and Kenya. “Many families eat just one meal a day, but it is often the quality rather than the quantity of the food that they eat that leaves them dangerously weak,” she says, pointing to reliance on staples such as maize and cassava, which have low nutritional value, as well as the lack of fresh fruit and vegetables. But she has also seen how simple, low-cost interventions can have a significant positive impact, transforming lives and preventing unnecessary deaths. According to A Life Free From Hunger, a new report by Save the Children, nearly two in five children in Africa – 60 million in total – are chronically malnourished. The report argues that malnutrition is the underlying cause of one third of child deaths worldwide, although it may not appear on their death certificates. Secondary illnesses such as diarrhoea, pneumonia and malaria, rather than chronic hunger, are usually put down as the cause of death. As well as causing fatalities, chronic malnutrition is having a devastating impact on children’s development. Without the necessary protein, vitamins and minerals, children’s bodies and brains do not develop properly. In Niger, for example, recent World Health Organization research shows the average two-and-a-half-year-old will be more than 8 centimetres shorter than a well-nourished child, and a 2011 UNICEF study found that one in three children in Zimbabwe suffers from chronic malnutrition. 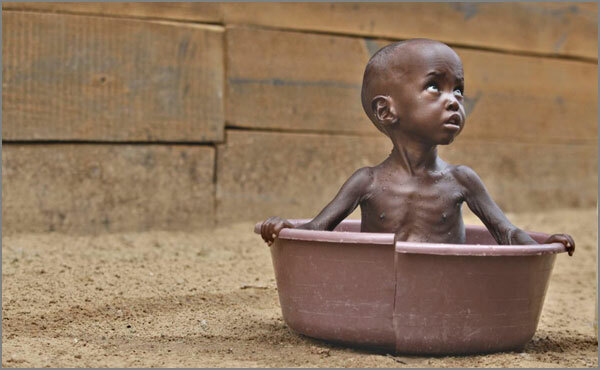 Nearly two in five children in Africa – 60 million in total – are chronically malnourished. Malnourished children often suffer from diminished IQs, and if they survive to adulthood are more likely to suffer from heart disease, diabetes and renal damage as well as being far less productive members of society. Despite a significant global reduction in child deaths, progress on tackling chronic malnutrition has been painfully slow. While over the past 20 years the number of deaths from tuberculosis fell 40 percent globally and deaths from malaria fell by over 30 percent in Africa, levels of stunting across the continent have dropped by just 1 percent over the same period. There are now growing fears that a combination of trends – including rising food prices, climate change and demographic shifts – could reverse even this modest gain. In a recent survey, also by Save the Children, half of families polled in Nigeria, Pakistan, Peru, India and Bangladesh said they were forced to cut back on food last year. The poll also found that 1 in 6 parents asked their children to skip school in order to work to help pay for the families’ food. In Nigeria, a quarter of all parents surveyed said their children sometimes or often go without food for an entire day, and 94 percent pointed to rising food prices as their most pressing concern. According to Assumpta, tackling chronic malnutrition is neither difficult nor expensive. “I have seen how encouraging breastfeeding and fortifying basic foods with essential minerals or vitamins can have an immediate and dramatic impact on children’s health,” she says. Back in 2008, the Lancet medical journal identified an affordable package of 13 direct interventions – including vitamin A and zinc supplements, iodized salt, and the promotion of healthy behaviour such as breastfeeding – that were proven to have an impact on the nutrition and health of children and mothers. It is estimated that it would cost little more than $10 billion per year to implement this package and help protect 90 percent of the world’s most vulnerable children from hunger. According to a 2011 report from the Food and Agriculture Organisation, three quarters of Africa’s malnourished children live on small farms and 43 percent of agricultural work is carried out by women. Key to improving nutrition is therefore improving agriculture among smallholders, sharecroppers and agricultural labourers, particularly women, by ensuring increased access to vital inputs such as land, tools, fertilisers and seeds, credit, agricultural services, markets and water. Integrating strategies on health, nutrition and agriculture has been shown to produce positive effects. In Mozambique, for example, where the Food Security and Nutrition Strategy is overseen by the Ministry of Agriculture, a significant decline in malnutrition rates has been achieved. Stories like this are all too common and highlight the urgent need for a concerted global effort to tackle malnutrition.